SWISS NAVY Premium Water Based personal lubricants are setting the standard in today’s marketplace. Swiss Navy Water Based Lubricants have patented leak-proof locking pumps on every bottle. Our pumps make Swiss Navy lubricants very travel friendly and spill proof via the locking pump. Our uniquely designed bottles have a high-end look. They are designed to be kept on the nightstand, not in it. Swiss Navy Water Based lubricant has a viscosity unlike any other water based lubricant. Swiss Navy Water Based comes out like a gel and liquefies with friction so it stays where you put it. 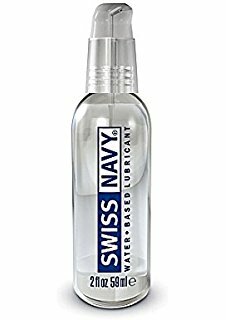 Swiss Navy Water Based Lubricant provides a silky feeling comparable to silicone, while being toy and condom compatible, as well as easy to cleanup. 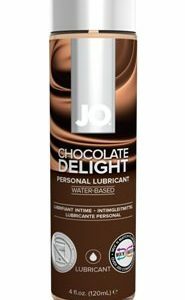 Our Water Based Lubricant is also pH-balanced for womens’ sexual health. 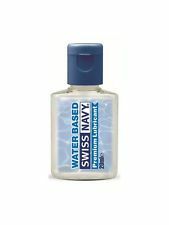 No “Permission to Come Aboard” is required with Swiss Navy as these great lubes are readily compatible with your vibrating toys. Leak-proof, lockable pump. Very travel friendly, no spills no mess, will not stain sheets. Made in USA-MD Science Lab LLC. 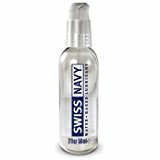 Now you can enjoy Swiss Navy Water Based lubricant in a variety of flavors.Don’t forget the handy 20ml travel-pack sizes. Flavors: Strawberry-Kiwi.Passion Fruit. Pina Colada and Chocolate Bliss.